Dimming saves energy while setting the right light level to improve mood and ambiance. Screw-in compact fluorescent lamps (CFLs) and screw-in light emitting diode bulbs (LEDs) are a great energy-saving alternative to incandescent or halogen light sources. Lamp manufacturers are designing their lamps today to work with commonly available dimmers. Energy-saving CFLs have been in the marketplace for many years but a broad range of dimmable bulbs has only recently become available. LEDs are even newer to the market and dimmable versions are also only recently available. 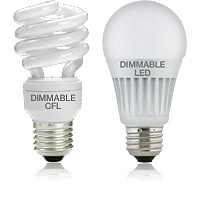 These dimmable bulbs, especially CFLs, have historically presented problems when used on standard incandescent dimmers. Reduced dimming range: Incandescent/halogen bulbs will typically dim lower than CFL or LED bulbs. Most dimmable CFLs will dim down to 10% to 30% measured light output. Early versions of dimmable LEDs on the market have the ability to dim lower than CFLs and can reach levels as low as 5% to 15% measured light. The actual dimming range is dictated by the bulb’s circuitry. Lights dropping out: As CFL or LED bulbs are dimmed, they will sometimes turn off before the slider reaches the bottom. Referred to as “drop out,” this makes it extremely difficult to set the dimmer at the right level without bulbs turning off. Lights not turning on: After being dimmed to a low light level and switched off, sometimes CFL or LED bulbs will not turn on until the dimmer’s slider is moved up. This is referred to as “pop-on,” which is especially challenging in 3-way situations where lights can be turned on/off from different locations, not just using the dimmer. Lights turning off unexpectedly: Dimmable CFL and LED bulbs can be influenced by line voltage fluctuations. As your incandescent bulbs will sometimes dim or flicker when a device such as air-conditioning or a hair dryer is used, a dimmed CFL or LED can actually turn off or flicker excessively in those situations. Note: Actual performance of any CFL or LED will vary from bulb type to bulb type and among different manufacturers. It is important to note that only bulbs that have been designed as dimmable should be used on a dimmer. To find out if your bulb is dimmable, please check the package, the bulb itself, or call the bulb manufacturer directly.